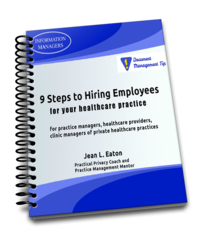 New healthcare practices frequently ask how to recruit employees. Here are easy hiring process templates that you can use right away to find your ideal candidate. even key steps to take when employees leave. Ensure that you create a work experience that is positive, inviting, and allows employees to have fun and make a positive impact in patient care. Your patient's satisfaction with the services that they receive at your practice will continue to improve, too. The primary job as a manager is to get work done through other people. As you help employees become successful, you will become successful. And a little help along the way is a good thing. Download the FREE E-Book (pdf) for tips that you can use right away!